Pulled into Oxford Services last night on my way home from me mother's. Through the second set of automatic doors stood a chugger, clanging a red bucket for Pudsey. I blanked them to the extent that their size, race and gender became a blue. I had no idea who they were. Entering the loo I was invited to spend a penny for pudsey. I could see that others had. Pennies piled brownly in a thick perspex casing. I am always tempted to break it, vandalise the promo poster, run off with the money. But I don't. My radical manners are not all they should be. I am controlled by laws of behaviour. I'm a good boy I am. Innit? "When I was getting your red bull the counter hand asked me if I minded increasing my bill by 10p for Pudsey. I told them that I certainly did mind". Is this a new style? Chug for free at WH Smith. Earn your WH Smith salary and do a chuggers job too. Cut out the chugger go straight to WH. Madge had felt offended that she had been asked at all. Me. I'm checking my paranoia. Where can I go to avoid Pudsey. Reminded me to put up an event on the We All Shot Pudsey facebook page though... I'll do it later. 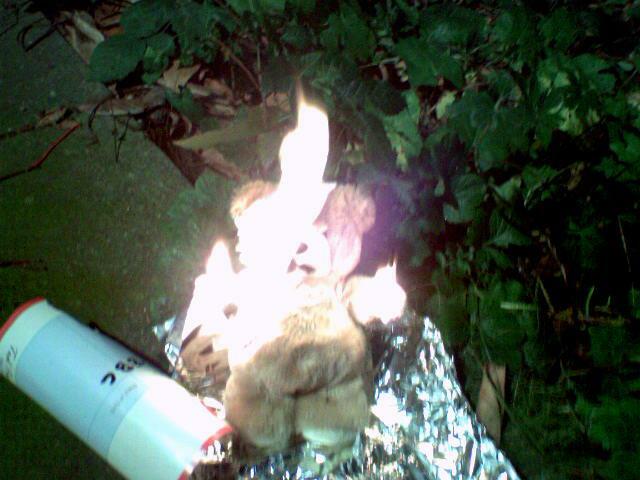 Burn Pudsey Friday is coming soon.